The papaya we eat today is descended from a small, wild progenitor that grew in the forests of Mexico and Central American long before Europeans set foot there. By 1,000 B.C., the Mesoamerican civilizations had already begun to domesticate it en mass, spreading seeds throughout the region. After European conquest they were carried to virtually every tropical and subtropical land mass, but because they are very intolerant to cold, they cannot be grown in an area where the temperature dips below 32° F without some protection, limiting their range. The trees (technically very large herbs) reach 6 to 10 feet in their first year of growth, and eventually get up to 20 or 30 feet, with a 12-16 inch diameter trunk. Looking up at a mature papaya tree, you'll see that they're packed with fruit. A healthy one can produce a steady 2 to 4 fruits per week for a total of 75 lbs for the whole season. Some extremely vigorous plants have produced as much as 300 lbs per year. Properly ripened Papaya fruit have a sweet, almost musky taste. If they ripen enough on the tree (turning a nice orange-yellow color), and you let the rind become nice and soft, the flesh will often have a wonderful, tangy aftertaste that's hard to beat. There are dozens of domesticated papaya varieties, and many more wild or semi-wild ones as well, each with a different taste. For any papaya to be at its best, though, it must be left to ripen on the tree, and also properly ripened off the tree. 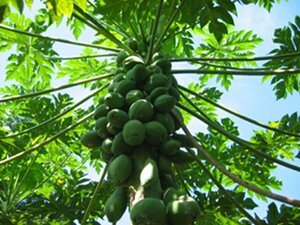 Learn how to select and ripen papaya here. You'll generally find two major types of papayas in US supermarkets. The first is often just referred to as Hawaiian, although many varieties are grown in Hawaii. The ones you'll see, though, are usually the Solo cultivar or one of its derivatives, which grows to the shape of a big pear of 12 to 22 oz. These are considered the perfect size for export by large fruit companies. The second type is often just called "Mexican Papaya," although, again, many cultivars are grown in Mexico. The cultivars you'll see are generally Mexican Red or Mexican Yellow. These are considerably larger fruit than the Hawaiian Solos, often growing to be 10 lbs or more. Like every other fruit and vegetable, papaya has its nutritional strengths and weaknesses. While it's important to note that pursuing isolated vitamin intake is folly, papayas have a rich mix, and like other whole, raw foods, are great for you. Papaya fruit are particularly noted for being loaded with vitamin C, folate, and potassium, though, and also has high levels of lycopene, vitamins E and A, and the carotenoids lutein and zeaxanthin. They've got 13 times more vitamin C and twice the potassium of an apple, and four times more vitamin E than an orange. They're also quite low in calories compared to other fruit at just 39 calories for 100 grams. A single 4 and 1/2 inch Hawaiian Solo is only 59 calories, meaning you can feast without worries. Learn how to incorporate the delicious papaya fruit into a health raw food diet. Read about other interesting fruit here. Figure out how to select the best papaya at the market and then ripen it properly.